Like the bittersweet, faded tobacco-and-beer pub aroma of yore, Clare Morrall’s new novel is an immersion in nostalgia. Set in Exeter, partly during World War II, partly some twenty years later, it’s a story of such familiar characters and uncomplicated predictions that readers can only assume this Booker-shortlisted author is flirting with our collective memories, not only of the eras but their stereotypes too. The upright but wounded lecturer, the kindly but formidable headmistress, the plucky brother and unbelievably gifted best friend – all play significant roles in a story of loss, isolation and late liberation that unspools like a pre-scripted black and white film, calling out for actors of the calibre of Kenneth More and Margaret Rutherford. 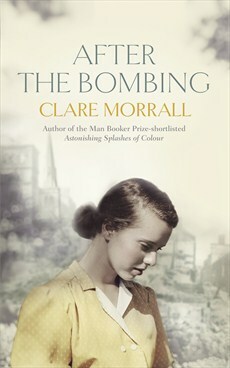 The novel’s central character is Alma Braithwaite, a teenage pupil at upmarket Goldwyn’s School in 1942 when Exeter – and other key British historical cities – suffered the revenge bombing attacks of the Baedeker raids. This terrible disaster, gravely evoked by Morrall, is only the first in a sequence of violent events that will rock Alma’s known universe. Re-encountered in 1963, the adult Alma appears frozen in place, now a music teacher at Goldwyn’s, still living in her childhood home, a place of dust and neglect, and still bottling up her emotions. A new headmistress with a secret, the reappearance of an old acquaintance – also with a scarred heart – and another world tragedy of a different order trigger developments. The author supplies a soundtrack in the form of references to Bach and Chopin, Glenn Miller and the Beatles – safe choices all, as is the territory of Morrall’s earnest, engaging but peculiarly mild story. Like the Horlicks sipped by various characters, the novel offers an easily digestible, very English flavour of the past, peopled by cheery bus conductors, good-natured housekeepers and other reassuring figures of the nation’s finest hours. Intended surely as a tribute yet heavier on the homage than the originality, this novel honours the past while bathing it in a warm sepia light, flattering to pretty much everyone. It’s heartwarming, but comes over as a complete fiction.